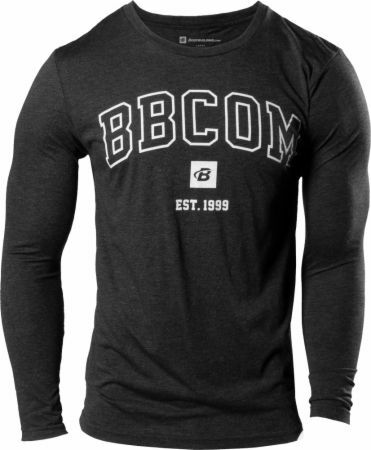 In 1999, Bodybuilding.com was founded on a simple, but strong belief: You deserve the best. We’ve outgrown the garage where we began, but we haven’t outgrown our commitment to quality. Celebrate our 20th anniversary, and your own dedication to excellence, with the limited-edition 1999 Collection. Breathable, next-to-skin fit supports intense exercise without the weight of heavier fabrics. Wicks sweat, without the squeeze. Chest 17.5" 19" 20.5" 22" 24" 26"
Length 27" 28" 29" 30" 31" 32"
Laying the garment flat, chest sizes measure across the front of the shirt from under arm to under arm. Laying the garment flat, length sizes measure from the highest point of the shoulder to the bottom hem of the shirt. No Est. 1999 Campus Tri-Blend Long Sleeve Reviews Found.